The word “Muslim” means one who submits to the will of God, regardless of their race, nationality or ethnic background. Becoming a Muslim is a simple and easy process that requires no pre-requisites. One may convert alone in privacy, or he/she may do so in the presence of others. Resources such as the 877-WHY-ISLAM hotline can help address any questions on this process. If anyone has a real desire to be a Muslim and has full conviction and strong belief that Islam is the true religion of God, then, all one needs to do is pronounce the “Shahada”, the testimony of faith, without further delay. 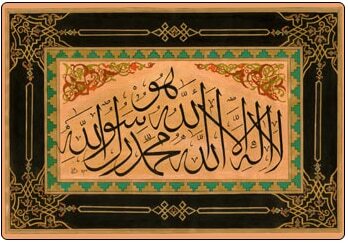 The “Shahada” is the first and most important of the five pillars of Islam. With the pronunciation of this testimony, with sincere belief and conviction, one enters the fold of Islam. I bear witness that there is no deity worthy of worship except the One God, and I bear witness that Muhammad (peace be upon him) is the Servant and final Messenger of God. Ash-hadu anla ilaha illal-Lahu Wahdahu la Sharika Lahu wa-ash-hadu anna Muhammadan abduhu wa rasuluhu. The declaration of faith consists of two distinct parts, i.e., the absolute belief in the Unity of God and the belief in the Holy Prophet Muhammad as a mortal human being and the Messenger of God. Islam’s fundamental belief is the Unity of God. All other beliefs hang on this belief. Therefore the acknowledgement and ‘bearing witness’ of this is the key to the Muslim faith. Unless this is observed one cannot be a Muslim. A Muslim accepts only One God, the only Master, Lord and Ruler with no partner sharing in any way His Being, Powers and Attributes. He is One; He is Unique; He is not the father of any one, nor He has or had any father. He is Almighty and Self-Sustaining. He is there forever, and will be there forever. The belief in the Prophet Muhammad, peace be upon him (pbuh), as the servant and Messenger of God completes one’s faith. The Holy Prophet was the greatest of all the Prophets of God, yet he was only a human being with no share in Divinity. This is a very important belief that keeps Muslims from associating partners with God. This part of the Declaration of Faith reinforces the first part of God being the only Supreme Being with no partners and also establishes the absolute authority of the Holy Prophet as the Messenger of God, who must be obeyed as well in all the matters of faith. The Holy Prophet is the last prophet who brought us the last Book (the Holy Quran) to be followed. He lived among his people for a long time and his life is documented in utmost detail. He led his followers by example. The way he lived his life and admonished his followers to live their lives is called Sunnah of the Holy Prophet. The second part of the Declaration of Faith makes obeying and following the advice of the Prophet Muhammad equally important to the belief in absolute Unity of God. This declaration makes one to completely submit to the Will of God and that is why one who declares this belief is called a Muslim – meaning one who completely submits to the will of God. Upon entering the fold of Islam purely for the Pleasure of God, all of one’s previous sins are forgiven, and one starts a new life of piety and righteousness. The Prophet (pbuh) said, “Do you not know that accepting Islam destroys all sins which come before it?” When one accepts Islam, they in essence repent from the ways and beliefs of their previous life. One need not be overburdened by sins committed before their acceptance. The person’s record after becoming Muslim is clean, and it is as if he was just born from his mother’s womb. One should try as much as possible to keep his records clean and strive to do as many good deeds as possible. God has promised paradise for the people leaving this world with this testimony of faith.